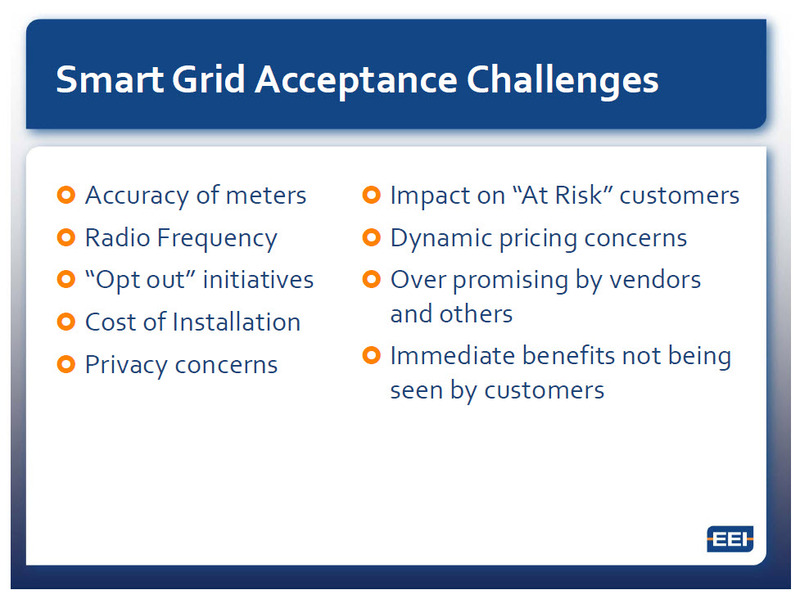 During the course of the webinar, it was explained by EEI representatives that they believed that the Smart Grid policy focus would now shift to the state level to address potential privacy and accuracy concerns raised by customers with smart meters, regulatory issues with rate recovery with the new meters, and expanding “opt-out” initiatives by customers that do not wish to switch from analog meters. Shown below is one of the slides used as a part of the webinar. Regarding the “acceptance challenge” of “Radio Frequency,” public health concerns with regard to smartphones and smart meters were characterized as “unfounded.” In addition, one representative further characterized the public’s health concerns to be “comic” in nature, indicating that people calling in to complain about smart meter health concerns were likely calling on cell phones. Here is an audio clip of the actual words (click on link/play button below). The individuals representing the EEI were clearly biased and insensitive to people who have health concerns regarding RF emissions. These individuals are likely people who drink their own Kool-Aid, so to speak, in that they are most likely unaware of the serious health concerns regarding the use of cell phones and smart phones and that there are reasonable grounds through the concept of analogy to also then question whether smart meters are safe. At a minimum, it is reasonable to question whether it is wise for an entire new smart grid industry to further saturate our environment with an added layer of RF emissions. 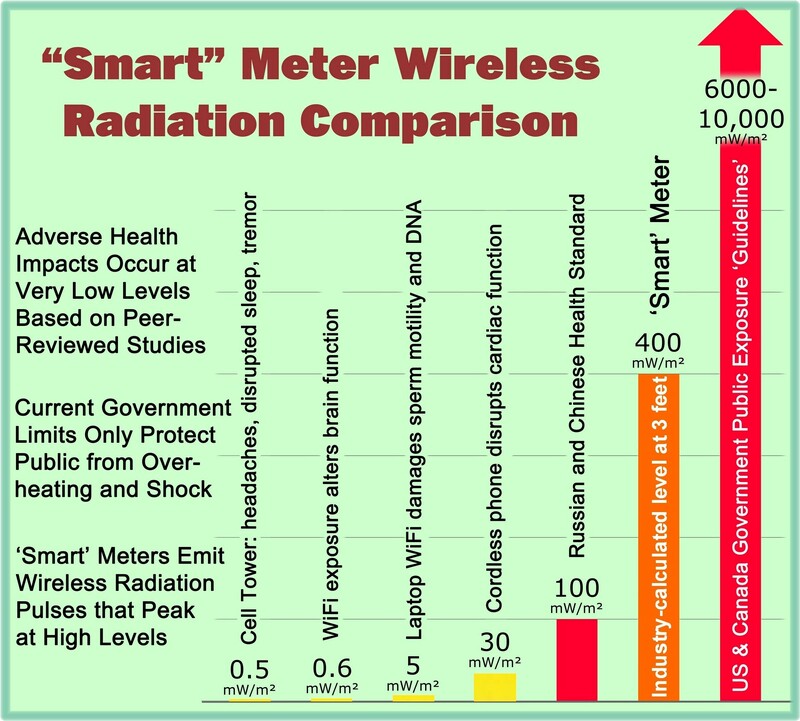 Also indicated in the testimony provided by Dr. Li, cell phone exposure is normally intermittent and is a voluntary experience, while wireless smart meter radiation exposure is chronic and involuntary. Smart grid advocates never want to acknowledge this important aspect. Nor do they acknowledge one of the basic tenets of risk perception, whereby people perceive risks differently based upon the nature of the risk, e.g., whether the risk is voluntary or involuntary. Involuntary exposure to RF emissions may be deemed as high risk if a person concludes that there is no desired benefit in return for the exposure received. What appears to be the situation here is that proponents of smart grid technology will document claims that there is no proof of harm from smart meters and then call that documentation a “study.” So who is really making the wild claims? The concerned citizens or the smart grid advocates? ** The Edison Electric Institute (EEI) indicates that it is “proud to sponsor SmartGrid.eei.org.” Organized in 1933, EEI is an association of U.S. shareholder-owned electric companies. This entry was posted in Smart Grid, Smart Meters, and RF Emissions and tagged De-Kun Li, Smart Grid. Bookmark the permalink.